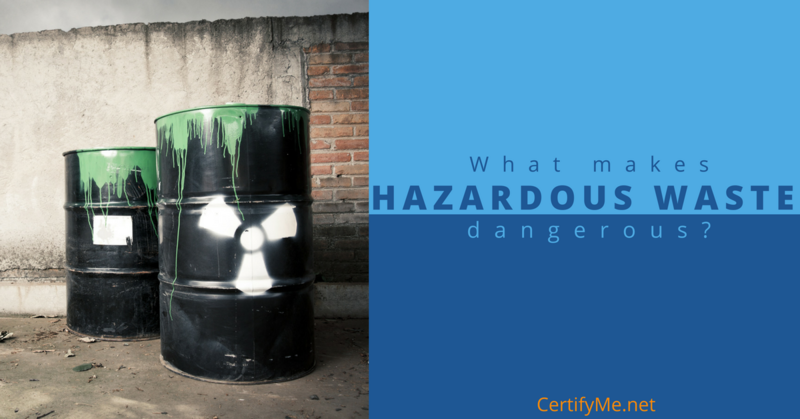 What Makes Hazardous Waste Dangerous? It may seem surprising, but you are most likely around different types of hazardous waste on a daily basis. Everyday items like batteries, mercury-contacting equipment like thermostats, and asbestos insulation and floor tiles are all considered hazardous waste that has the potential to harm human health. For professionals who work in construction, maintenance and disposal/removal work, it is especially imperative to learn how to identify hazardous waste, how to respond to positive findings, how to remove it properly, and how to protect your health. What Exactly is Hazardous Waste? Hazardous waste is waste that has properties that make it potentially harmful or dangerous to human health or the environment. Hazardous waste can be a liquid, solid, or gas, and can even be invisible to the eye. It can also be by-products of manufacturing processes like discarded materials and discarded unused commercial products like cleaning fluids and pesticides. Review the F and K Lists and P and U Lists for all types of hazardous waste found on this page. What Are the Characteristics of Hazardous Waste? Hazardous waste is any substance that exhibits one or more of the following characteristics: Ignitability, corrosivity, reactivity, and toxicity. The RCRA is a sector of the EPA that stands for Resource Conservation and Recovery Act and regulates the proper management of hazardous and non-hazardous waste. Ignitability includes liquids with a flashpoint below 60-degree Celsius, non-liquids that can cause fire through specific conditions, and ignitable compressed gases and oxidizers. Corrosivity means that a liquid can corrode steel. It also includes aqueous wastes with a pH score of less than or equal to 2, or a pH greater than or equal to 12.5. Reactivity wastes are hazardous because they can react or become unstable under normal conditions, like coming into contact with water, giving off toxic gases, or exploding under normal conditions or when heated. Toxicity includes wastes that have toxic properties and are harmful when ingested or absorbed. They are dangerous because they can leach from waste and pollute groundwater. How is Hazardous Waste Removed and Disposed of? Is the waste specifically excluded from the RCRA? Review section 40 CFR part 261 on the Government Federal Regulations website for full explanations of these questions and answers. Once the waste has been identified, removing it correctly will be very important to avoid any potential health risks and disturbing the surrounding environment. To prevent contamination, personnel should avoid work practices that increase contact with hazardous waste, use remote sampling and handling, protect monitoring and sampling tools through bagging, wear disposable clothing and disposable equipment when possible, cover equipment and tools with disposable coating, and encase the source of contamination with plastic sheeting or overpacks. Personal protective equipment (PPE) must be given to all workers free of cost before beginning work in an area contaminated with hazardous waste. Decontamination and removal methods typically involve physical removal and chemical removal. Physical removal involves dislodging or displacing, rinsing, wiping off, and evaporation of contaminants. Physical methods can also involve high pressure and heat to remove hazardous waste. Without proper removal and decontamination methods, workers, citizens, and the environment are put at risk of exposure and toxicity from hazardous wastes. Chemicals and asbestos materials have respiratory illness and cancer-causing properties for humans. Hazardous waste can seep into the ground and contaminate the soil from which food is grown and leach into the groundwater from which people drink. The proper identification and disposal of hazardous waste is not only imperative during the removal process for workers involved, but also for the entire community in the long-term. HAZWOPER stands for the Hazardous Waste Operations and Emergency Response Standard and is essential for workers and employers involved in clean-up operations involving hazardous waste, corrective actions involving clean-up operations, voluntary clean-up operations at uncontrolled hazardous waste sites, operations involving the treatment, storage and disposal of hazardous waste, and emergency response operations for release of hazardous waste. The OSHA-compliant HAZWOPER training course from CertifyMe.net will help your business comply with industry regulations and keep your workers safe. It teaches all employees involved in hazardous waste management, including forklift operators, how to properly identify, manage, and remove hazardous substances. We offer 40-hour initial HAZWOPER training and 8-hour refresher HAZWOPER training courses both online for convenience and stress-free learning. Learn more about our OSHA-compliant and comprehensive HAZWOPER training and forklift operator training courses on our website. Stay safe and remain compliant!